I have been buying material and supplies for my small business. I also got a farm loan to purchase some land, and I will be paying it back right now with personal funds. Can I claim any of this back, and how would I get any of this money back later on? I'm not sure by reading your question if your business is a farm or something else. 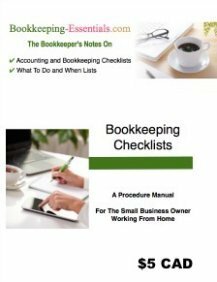 My suggestion to you is to start by reading my article on How To Create An Audit Trail and the article called Managing the Books Yourself. There is some overlap between the two articles ... because there are some basic things you need to be concerned about ... such as keeping your personal finances separate from your business finances. I explain how to do that. The Audit Trail article does have a section that explains how to reimburse yourself if you have used your personal funds for business expenses ... look for the subtitle Expense Reports - Keep it to a Minimum. Without a few more details, that is all I can suggest for the time being. If after reading the information, you have more questions ... just post back here by clicking on the "comments" link below. Oh dear. 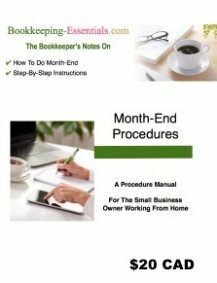 So I was talking to some other bookkeepers and I think I might be doing something wrong. If I am I want to correct it ASAP as the CPCC I started working for is really new and I am only a few transactions in and could do it all again fast correctly. How would you suggest going about recording expenses, like food or gas that was paid for from personal money and they would like to be reimbursed? Would I debit the expense account like gas, office supplies, and what not and credit the shareholder's loan or current liability account? Both are liability accounts. The money isn't paid back very fast at all? I moved your post as a similar posting on this topic had been made in the forum before. The original post above gives the link on how to reimburse owners who used their personal money to pay company bills. I just want to make it clear that this is not a good practice ... although I know "stuff" happens. You may want to take some time to read the forum post on How to Book Meals & Entertainment Expenses and How Should the Company Reimburse You for Personal Vehicle Expenses When You are Incorporated?.